It isn't very color accurate, but it shows you what the polish packaging looks like, and if you can't find the set locally you may be able to snag them Online! I did swatches on a nail wheel at both 1 and 3 coats, so let's take a look at each polish by itself! The polishes don't have any individual names, so I'll just be calling them by color. This color is pretty awesome. I'm not a fan of neon colors but the addition of multicolored glitter in two different sizes works surprisingly well. It dries fast to a matte neon finish. I left my swatches matte, but I'll try it with a shiny topcoat when I get around to wearing it. I was afraid neon polish and glitter would be a horrible mix, but this was surprisingly easy to work with. 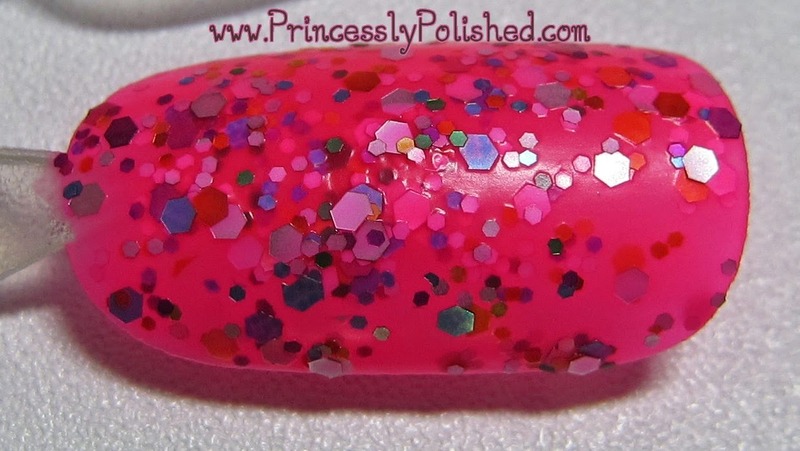 The base polish has a transparent quality, so either plan to use at least 3 coats or layer it over your favorite neon pink polish. I didn't have any problems getting the glitter to spread, but I was also sure to take time between coats. This grass green polish is loaded with two sizes of metallic rainbow glitter, but the colors that stand out the most are orange, fuchsia, red, and silver. It gives off a tossed salad vibe. 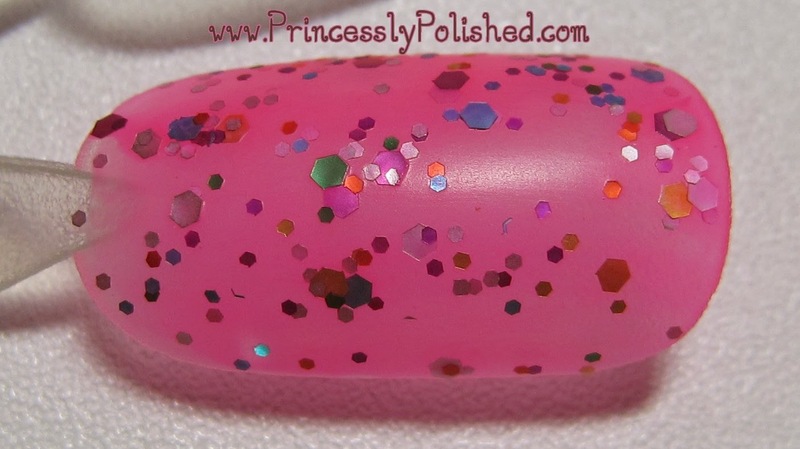 This polish seems the least glitter-packed out of the entire set, with more large glitter than small glitter. The green base of this polish is a sheer jelly so it would definitely need to be layered over another green to look it's best, but that also keeps it looking shiny. I was happy with the glitter coverage and the fact that it didn't get lost in a too-thick creamy polish. 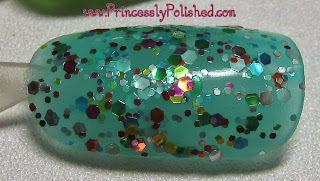 I think this polish should qualify as mermaid approved! Once again it ended up being a sheer jelly polish so unless you actually are a blue-tinged mermaid girl it will probably need an opaque base color to be looking it's best. 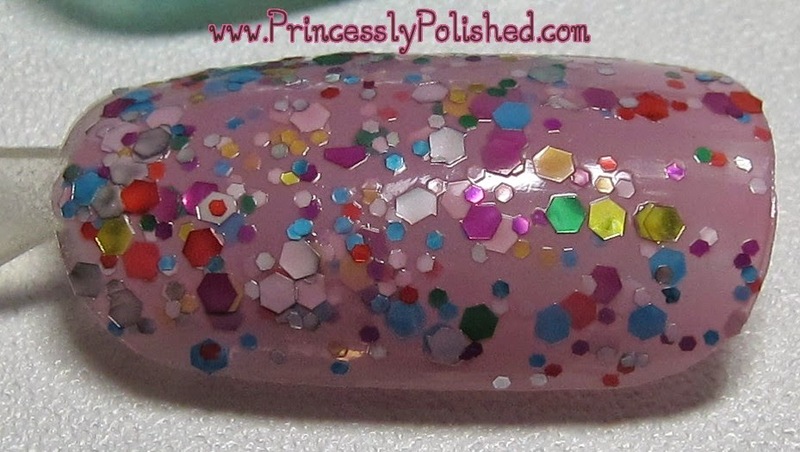 The glitter in this polish was a tiny bit more finicky to work with than in the other colors, but I was still pleasantly surprised by the consistency and ease-of-use. Everything dried looking shiny, too. 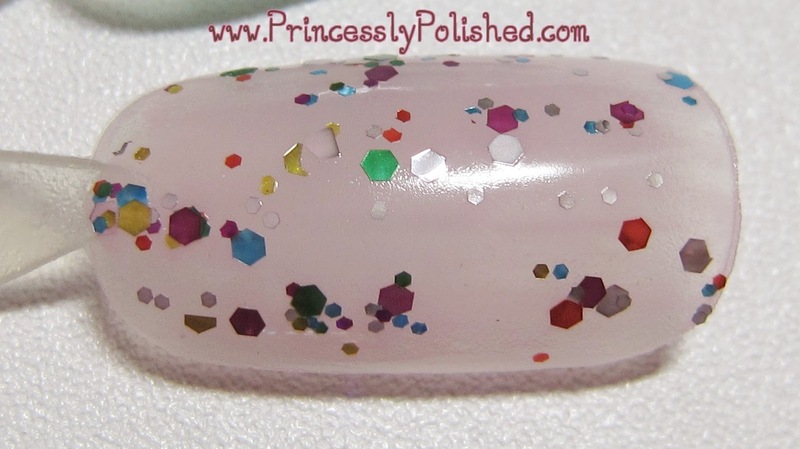 I thought this might be a rebottling of Claire's polish Candy Shop, but this is clearly a paler base color. I had passed on Candy Shop because that warm pink would have majorly clashed with my skintone. This one is much more french manicure friendly. I ended up liking this one even more than I thought I would, probably because it manages to look different from LA Colors Candy Sprinkles. Being jelly based but not patchy should make it a good one-coater for a glittery french manicure, too. 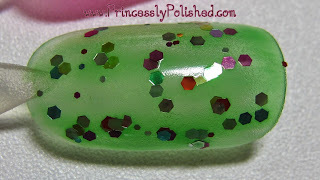 Swatched last and expected to be least favorite out of the set, this polish was a surprise winner. I swatched it over a half-black nail, but what I really want to try this over is white, because the large glitter pieces reflect a whole rainbow of pastel colors. I only bothered doing one coat because I don't think this polish would benefit from layering like the others do. It's quite packed with glitter! 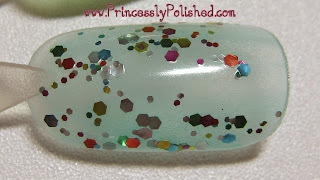 I spot the full roygbiv of iridescent glitter in there, and in a pretty even ratio, too. Generally these polishes lean distinctly toward one color, and it gets a little boring. The clear base makes it very versatile, so this one is a keeper! This set ended up being fantastic, and I would recommend picking it up even if it is only marked down to $5.00. Claire's mini size is 7.5ml, pretty generous, and these don't seem to be available in full size as singles. 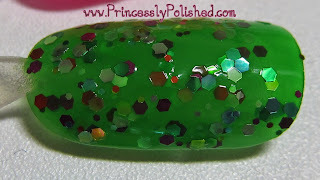 I was leery of the polishes being low quality, gloopy messes but that wasn't the case at all. My one peeve would be that these don't contain any mixing balls to stir the polish, but so far there haven't been settling issues. These are definitely candidates for using on my Peel-Off Aqua Base Coat for easy removal. 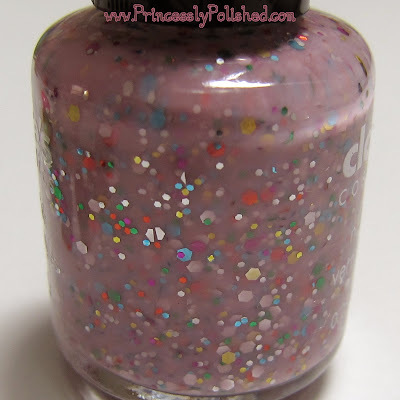 These aren't gritty but they do have glitter texture, so use topcoat accordingly. Hopefully you can find them if you fall in love with them like I did! I just bought these from someone on Ebay and love the set...really cute and fun! !